For my daughter's 3rd birthday party, we asked all the girls to wear princess dresses. 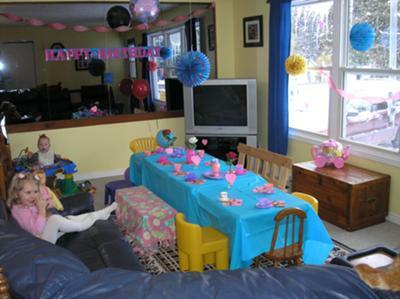 I set up tables in our living room with bright colored plastic table cloths and put up paper lanterns. I served pink lemonade in the tea pots and used little tea cups for the girls. My daughter and her friends loved the "Pink Lemonade" Tea Party!